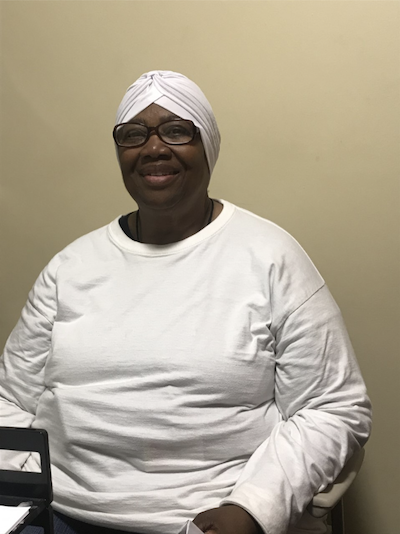 Cynthia has been at the Kearney Center since September, 2018. Cynthia has been accepted for a set aside unit at an apartment complex here in Tallahassee and she is in need of $600 for the security deposit and $178.50 for utility deposit through City of Tallahassee. After this is paid, Cynthia will be able to afford the rent going forward. The Crucifixion of Christ. I love that movie because it explains his death, burial and resurrection. It was in Latin but the details were amazing. I felt like I was reading the bible. I thoroughly enjoyed it. What is your favorite genre of music? Which artist? My favorite type of music is Gospel. I don’t have a favorite artist but I love it all. My favorite foods are chocolate, candy and cakes but I can’t have it due to my heart issues so I eat a lot of fruit. My greatest accomplishment in life was graduating college, I majored in Religion and minored in Accounting. This is my greatest accomplishment because many people did not believe in me and told me that I would not be able to accomplish obtaining my education. The thing that I feel most grateful for is the fact that I can work with and help abused children. Somehow, I have been able to find many of these children and I have been able to help them into a safe, clean environment.